For the British use of the term, see Townhouse (Great Britain). For the Scottish use of the term, see Seat of local government. A townhouse, townhome, or town house as used in North America, Asia, Australia, South Africa and parts of Europe, is a type of terraced housing. A modern town house is often one with a small footprint on multiple floors. In British usage, the term originally referred to the city residence (normally in London) of someone whose main or largest residence was a country house. 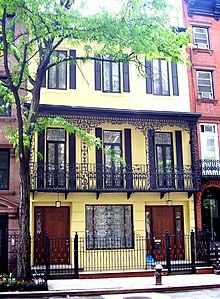 Historically, a townhouse was the city residence of a noble or wealthy family, who would own one or more country houses in which they lived for much of the year. From the 18th century, landowners and their servants would move to a townhouse during the social season (when major balls took place). 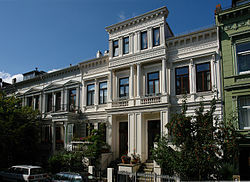 In the United Kingdom, most townhouses are terraced. Only a small minority of them, generally the largest, were detached, but even aristocrats whose country houses had grounds of hundreds or thousands of acres often lived in terraced houses in town. For example, the Duke of Norfolk owned Arundel Castle in the country, while his London house, Norfolk House, was a terraced house in St James's Square over 100 feet (30 meters) wide. In the United States and Canada, a townhouse has two connotations. The older predates the automobile and denotes a house on a small footprint in a city, but because of its multiple floors (sometimes six or more), it has a large living space, often with servants' quarters. The small footprint of the townhouse allows it to be within walking or mass-transit distance of business and industrial areas of the city, yet luxurious enough for wealthy residents of the city. Townhouses are expensive where detached single-family houses are uncommon, such as in New York City, Chicago, Boston, Philadelphia, Toronto, Washington, DC, and San Francisco. Rowhouses are similar and consist of several adjacent, uniform units originally found in older, pre-automobile urban areas such as Baltimore, Charleston (South Carolina), Savannah and New Orleans, but now found in lower-cost housing developments in suburbs as well. A townhouse is where there is a continuous roof and foundation, and a single wall divides adjacent townhouses, but some have a double wall with inches-wide air space in between on a common foundation. A rowhouse will generally be smaller and less luxurious than a dwelling called a townhouse. 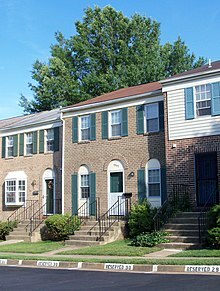 The name townhouse or townhome was later used to describe non-uniform units in suburban areas that are designed to mimic detached or semi-detached homes. Today, the term, townhouse, is used to describe units mimicking a detached home that are attached in a multi-unit complex. The distinction between living units called apartments and those called townhouses is that townhouses usually consist of multiple floors and have their own outside door as opposed to having only one level and/or having access via an interior hallway or via an exterior balcony-style walkway (more common in the warmer climates). Another distinction is that in most areas of the US outside of the very largest cities, apartment refers to rental housing, and townhouse typically refers to an individually owned dwelling, although the term townhouse-style (rental) apartment is also heard. Townhouses can also be "stacked". Such homes have multiple units vertically (typically two), normally each with its own private entrance from the street or at least from the outside. They can be side by side in a row of three or more, in which case they are sometimes referred to as rowhouses. A townhouse in a group of two could be referred to as a townhouse, but in Canada and the US, it is typically called a semi-detached home and in some areas of western Canada, a half-duplex. Condominium (strata title), where one owns the interior of the unit and also a specified share of the undivided interest of the remainder of the building and land known as common elements. Freehold, where one owns exclusively the land and the dwelling without any condominium aspects. These may share the foundation as well but have narrow air spaces between and still referred to as a townhouse. Condominium townhouses, just like condominium apartments, are often referred to as condos, thus referring to the type of ownership rather than to the type of dwelling. Since apartment style condos are the most common, when someone refers to a condo, many erroneously assume that it must be an apartment-style dwelling and conversely that only apartment-style dwellings can be condos. All types of dwellings can be condos, and this is therefore true of townhouses. A brownstone townhouse is a particular variety found in New York. In Asia, Australia, and South Africa, the usage of the term follows the North American sense. Townhouses are generally found in complexes. Large complexes often have high security, resort facilities such as swimming pools, gyms, parks and playground equipment. Typically, a townhouse has a Strata Title; i.e., a type of title where the common property (landscaped area, public corridors, building structure, etc.) is owned by a corporation of individual owners and the houses on the property are owned by the individual owners. In population-dense Asian cities dominated by high-rise residential apartment blocks, such as Hong Kong, townhouses in private housing developments remain almost exclusively populated by the very wealthy due to the rarity and relatively large sizes of the units. Prominent examples in Hong Kong include Severn 8, in which a 5,067-square-foot (470.7 m2) townhouse sold for HK$285 million (US$37 million) in 2008, or HK$57,000 (US$7,400) per square foot, a record in Asia, and The Beverly Hills, which consists of multiple rows of townhouses with some units as large as 11,000 square feet (1,000 m2). Commonly in the suburbs of major cities, an old house on a large block of land is demolished and replaced by a short row of townhouses, built 'end on' to the street for added privacy. ^ For a description of an 18th-century town house in England, for example, see Olsen, Kirsten. Daily Life in 18th-Century England. Greenwood Publishing Group, 1999, pp. 84–85. Also see Stewart, Rachel. The Town House in Georgian London. Yale University Press for the Paul Mellon Centre for Studies in British Art, 2009. ^ For a history of the town house in the United States, see Herman, Bernard L. Town House: Architecture and Material Life in the Early American City, 1780-1830. UNC Press Books, 2005. 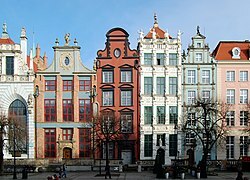 Wikimedia Commons has media related to Townhouses. Cunningham, Peter. Handbook of London Past and Present, London, 1850 (see section 20: "Palaces & Chief Houses of the Nobility & Gentry in the Present Day). Daisy, Countess of Fingall. Seventy Years Young. First published 1937 (autobiography of an Irish peer's wife, covering the late nineteenth and early twentieth century).